If you are thinking of a trip to Italy to stock up on all that wonderful food and to buy some unusual Christmas presents, the Oh Bej! Oh Bej! Fair in Milan is for you. 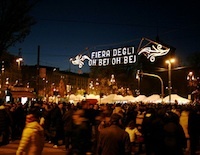 The Fair coincides with the celebrations for the city’s patron saint, Sant’Ambrogio [St Ambrose, c.339 – 397], on 7th December. A festival and market in his honour first took place around the area of Santa Maria Maggiore Church in 1288 but the Fair we know today dates back to 1510, with the arrival in the city of one Giannetto Castiglione, Grand Master of the Order of Saints Maurizio and Lazzaro. Sent to Milan by Pope Pius IV to reawaken the faith of its sceptical population in the saints, Giannetto, as he approached the city, began to fear that he would be unwelcome. Therefore he made a stop to purchase gifts of toys and sweet foods and these he distributed to the curious Milanese children who surrounded his procession as it entered the city. 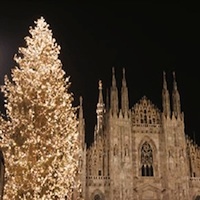 By the time Giannetto and his entourage reached the Basilica of Sant’Ambrogio the people were in festive mood. The Fair’s name comes from the children’s dialect exclamations as they opened the presents, crying, “Oh bej! Oh bej!” [“How beautiful! How beautiful!”] and even today, some of the market traders use this expression to attract custom. The Fair took place around the Basilica of Sant’Ambrogio for many years but was recently moved to the Castello Sforzesco for reasons of space. This year there will be more than 400 stalls, selling everything from antiques to flowers to food. There is a happy, bustling, Christmas atmosphere at the Fair and people traditionally buy and eat roast chestnuts and drink vin brûlé [mulled wine]. There are, of course, religious celebrations in honour of the saint as well and most of these will take place in the Basilica di Sant’Ambrogio, which is well worth a visit: founded by Bishop Ambrogio himself and built between 379 – 396, the original name of the Church was Basilica Martyrum because of its location in an area where many martyrs of the Roman era were buried. It was rebuilt in Romanesque style in 1099. The façade, which appears rather “flat” is typical of Lombard architecture of the period. The Church has two loggias and two bell towers, from the tenth and thirteenth centuries. Inside there are many masterpieces of medieval art and a particular kind of pulpit called an ambo. There is a bronze, Byzantine serpent on top of a column to the right of the nave. The Sarcophagus of Stililchone, carved in 395, is a feature from the original Basilica. There is also a golden altar dating from 835. In the crypt visitors can see the glazed and dressed skeleton of Sant’Ambrogio himself.